The Zambezi Cycle Challenge raises funds to preserve the environment surrounding the river. These funds will be raised through providing a top class, uniquely challenging and adventure filled experience through beautifully scenic and natural reserves for participants that are conservationists as well as adventure enthusiasts. The format of the Challenge will seek to embrace the social weekend warriors, wildlife enthusiasts as well as the racing snakes. Teams will be require to be made up of at least two members, but the race organisers will consider single applicants for as long as they agree to be grouped with other cyclists of a similar ability. The mechanical back up team will also be situated at the Kingdom Hotel and will be there to assist with any mechanical hiccups the riders may experience. They will only be charging for parts and consumables used. Please note that this team will not be offering bike washing as part of their service nor will they be doing routine servicing of bikes – they will be there to assist with serious mechanical faults only. Please bear in mind that there will be a limited stock of spares and the team will do the best they can with what is available. There will be bike washers on hand, but please tip them as you see fit. The Zambezi River is 2700 kms in length and crosses through 7 countries before finally reaching the Indian Ocean. A lifeline to animals and humans alike throughout its course, it also provides borders, electricity and a natural beauty that brings tourists from afar to see it. 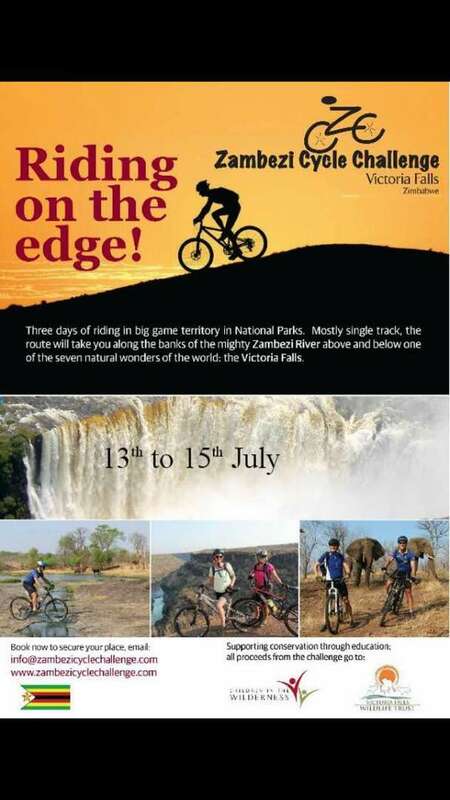 Where the Zambezi plunges over 100 meters into the Batoka Gorge and forms one of the 7 natural wonders of the world, The Victoria Falls, sets the backdrop for the 3rd running of the Zambezi Cycle Challenge. Distance: 3-day stage event, covering between 50 to 80 kms each day.